There must be tape or something. Again, clucks, three words: Watergate. And to remind you for the zillionth time, this is coming apart MUCH MUCH FASTER than that did. I wonder if these two post here? Remember when Murkan right wing males didn't have vaginas? On video. On Faux 'News'. I bet they still b!tch about football players who kneel are being disrespectful to the flag and the troops though. Oh, you meant the two guys in the picture. I thought you meant Giuliani and Trump. Anymore can lump about half of the GOP in the hypocrisy or irony regarding statements they made in past compared to their actions/statements about trump. Some people really seem to be of the opinion that Reps vs Dems is nothing more than a sports rivalry with the outcome being only important for bragging rights, but not for any real life consequences. At least there is no other way I can explain it. "I have decided to be happy because it is good for my health." Much MUCH faster than Watergate. Are they a couple? They look sorta 'close'. They must be happy, since they're both pregnant. took a look at Nixon's polling and discovered a few rather intriguing things. First, during his first term, he regularly held a 50%+ job approval rating. And held (by today's standards) a shockingly high approval by the Dems, hovering around 40% And after a burst of approval in 1972 -- trip to China, re-election, Paris Peace Accords -- his approval drops through the floor in 1973. Over the 9 months from Feb73, he lost over 4-points a month to level off at 30%....from a high of 67%. It made Bush's approval drop in 2005 look like a nice, leisurely slide. But here's the kicker: After that drop, his approval rating stayed remarkably stable right up to his resignation. By the time of the "Saturday Night Massacre", the results were already in and those who were going to be for or against had already decided where they stood. And that changed only very very slightly to the point where Nixon left Office. Let's look at that point again (quoting PRof. Franklin): "The shocking Saturday Night Massacre, Nixon cited as an 'unindicted co-conspirator', the release of tape transcripts that introduced 'expletive deleted' to the lexicon barely moved opinion." 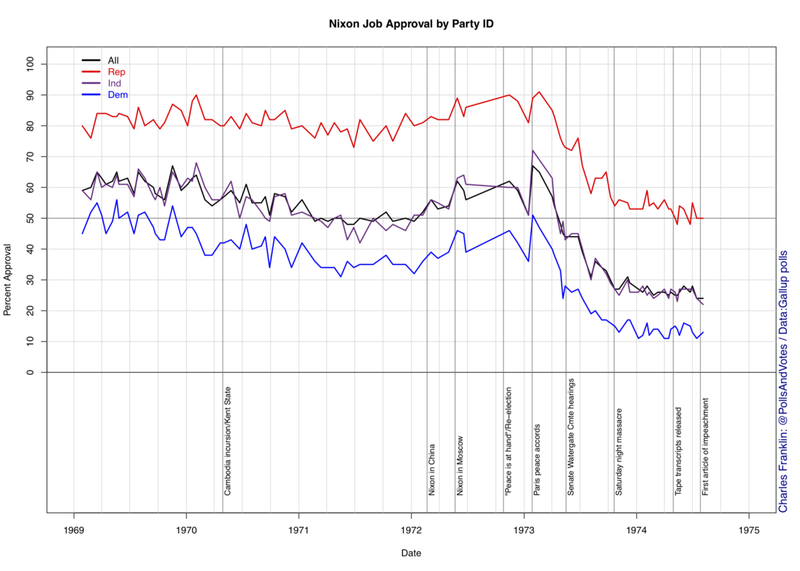 Note that even at Nixon's worst period, Republican respondents to polls were still slightly over 50% in favour of him. Right up to the end. His approval did drop with Republican voters after he resigned, but only afterward, which has some strange symmetry with approval rates of the ACA before and after Trump. And this beggars comparisons to Trump's approval ratings today WRT the entire Russia investigation, and is the point that Prof. Franklin I think is pointing at: The decisions of the public about where they stand with the question have pretty much been decided. We might see a +/-5% variation in Trump's approval ratings from his 40% aggregate average, but that probably won't be tied to Mueller's probe much, if at all. Until, probably, the final result of the investigation as a whole, which won't be finalized for at least another year, and very possibly into the 2020 campaign cycle. Then we'll see some changes. Probably. Question for Traiv, just read this, can he really do what he is saying I think not. "Run it" as in be in charge of the day-to-day operations....I agree, I don't think so. Specifically, due to his position, he couldn't run it; that's a function of the DoJ. Remember that Mueller was appointed Special Counsel by Deputy AG Rosenstein; it was not requested by the White House or Congress (although both could do so). However, Trump has certain powers over the investigation, including dismissing the Special Counsel, Robert Mueller. Politically, it would be a disastrous decision, and could have some serious legal ramifications down the line (the whole "Obstruction of Justice" question would be given far more weight and would probably broaden the investigation beyond where it is already). 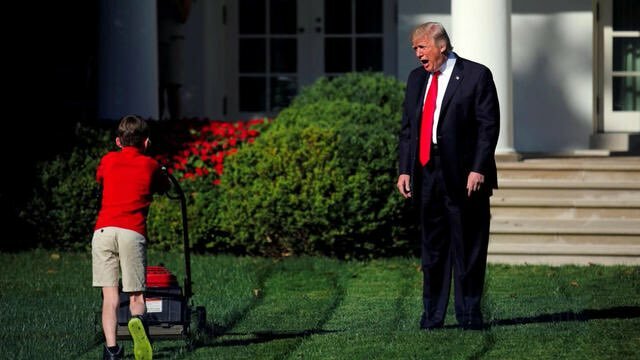 Trump likes to think that the President can do just about anything he wants, which simply isn't the case, and I think he's going to find that out the hard way (above and beyond the Courts telling him that his EOs are out of line and unenforceable). Like I said, Trump has already made Grant look competent and is currently working hard to make Harding look.....no so bad (which is a scary f*ckin' think when you think about it). I dont see Mueller offering/accepting the guilty plea without cooperation in the collusion and obstruction cases. Yeah,Manafort's plea deal includes a co-operation clause. Once again an investigation has concluded with a plea having nothing to do with President Trump or the Trump campaign. The reason: the President did nothing wrong and Paul Manafort will tell the truth. Note that the White House sent a "corrected" statement that removed the bit about Manafort telling the truth. BTW, you should all dig into the plea agreement; there's some tasty stuff there. Including the specific notation that Manafort must cooperate fully in "any and all matters as to what the Government deems the cooperation relevant." It also says he agrees to testify at any proceeding in any federal district-including grand juries. Paul Manafort has flipped. So what happens now? No, they won't. Just like in a few other threads, they can't spin this. At least not yet. But when Trumpet himself has not responded, they won't. At least he has not so far on his TWITter and we know he will go there first. Even Foox is tweeting stuff like how good Nike is doing right now and politicians reacting to Manafort flipping without disparaging them. This may actually be the one. KT McFarland has changed her statement and now says that Flynn did talk to the Russians and Flynn implied sanctions were discussed. And here you thought you'd never see this thread again. The U.S. Senate Intelligence Committee is pursuing a wide-ranging examination of former White House adviser Steve Bannon’s activities during the 2016 presidential campaign, three sources familiar with the inquiry told Reuters. Bannon's lawyers are saying that they just want to talk to him and that there's no investigation. DOJ is looking to prosecute Assange or however you spell his name, owner of Wikileaks. That guy. This is a big deal in regards to the Mueller probe and Stone/Trump's involvement. Trump said today he "crafted" all his answers for the Mueller questions. I imagine it was like this. I was out of the country and just got back. 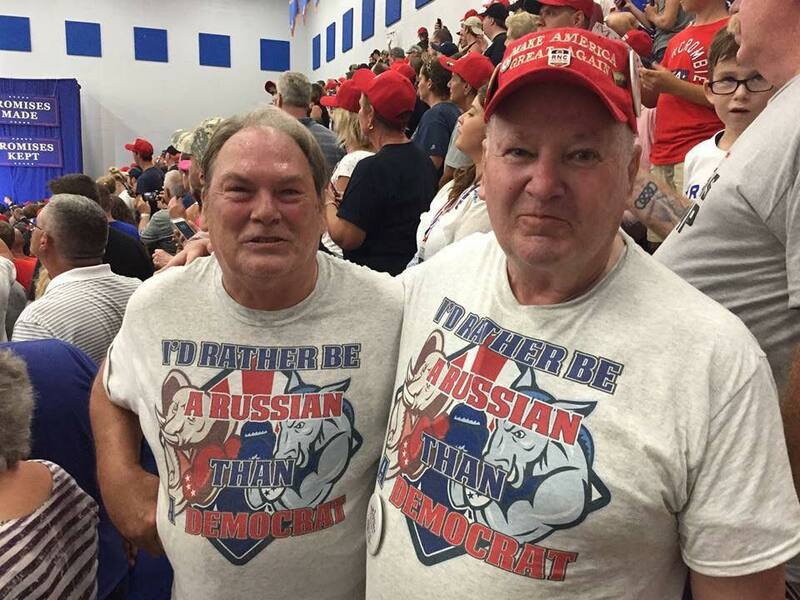 Did they get Trump on this Russia thing yet or are they still trying?... I see Stormy's lawyer is in some trouble so I guess it's as good a time as any to go back to the Russian narrative. There's that zero learning curve again. You can only hope. I can only imagine your disappointment when Trump is found innocent of this scam. I hope you don't have any loaded weapons in the house. No, Beav. That's not 'hope' Those are 'facts'. I know calendars and stuff are too hard for you. As far as weapons, what would I need one for? Seriously, what part of this is hard for you to grasp? Of course, there have been many more indictments since then. I can only imagine your disappointment when Trump is found innocent of this scam. Ah, Little Fascisti, if that were the only target painted on your Dear Leader's back, you might have a hope. There are concrete indications that special counsel Robert Mueller is now about the business of laying down the last big pieces of the puzzle of Russian intervention in the 2016 election. Mueller already has done the difficult digging on the Russian side of the equation, bringing detailed indictments in February 2018 for a wide-ranging Russian trolling operation related to the campaign, as well as the July 2016 hacking of Democratic Party emails. Now he’s looking to tie those allegations to people close to the Trump campaign. The upshot may be allegations of "collusion," of the sort the president has long denied. The actual charges are likely to be one of three criminal conspiracies: violating federal election laws, violating computer laws, or soliciting or receiving something of value from a foreign government. Charges, in other words, that not even the most ardent Trump die-hard could trivialize. They bring with them the possibility that Mueller might opt to name President Trump himself as an unindicted co-conspirator. And that doesn't even take into account the Obstruction of Justice investigation Mueller is also on WRT the Comey firing. Think it's YOU who better start hoping. After all, we're just getting to the point in the time-line where, in 1973, Nixon's feet were just beginning to be moved closer to the fire. And he was only under investigation for one charge: Obstruction of Justice. To be realistic, tRump may skate at any stage of the process. Rich white guys almost always do in this country. But 'proven innocent', even if any such thing existed at law, which it does not as anybody but a moron knows... not real f*ckin likely. And when you add some awesomeness like Mueller is using defendant's tweets in his probe and questioning, and Trump picking a fight with Chief Justice Roberts, you know.. the deciding vote on SCOTUS on whether indictments go through and stuff, Trump has done himself zero favors. I can't wait. How f*cking stupid do you have to be to not be able to read between the lines here?